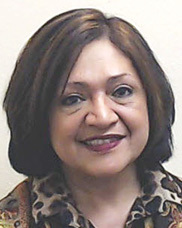 Patricia Q. Garcia is the former Director of Volunteer Services of the lead trauma, 402-bed, regional Medical Center Health System (MCHS) in Odessa, Texas. She was responsible for the management, development, and consultation of volunteer resources. She is a national, state, and local speaker on volunteer management, communications, and leadership issues, and she serves as the official liaison for MCHS’ Hispanic community relations and outreach initiatives. Garcia worked as director of volunteer services at MCHS for 20 years, from 1997 until her retirement in December 2017. Previously, she worked as a broadcast journalist, a career path she began as a high school sophomore and continued to pursue for the next 12 years. Her background in broadcast journalism continues to influence her work in non-profit management and healthcare communications. She is a Certified Administrator of Volunteer Services (CAVS). In 2017, Garcia served as president of the Texas Association of Director of Volunteer Services (TADVS), having previously served as District Director and Communications Chair. She is also a member of the Association of Healthcare Volunteer Resource Professionals (AHVRP) and many other professional organizations on the local, state, and national levels. She lectures widely on leadership, communication, volunteer management and engagement, and teen volunteers.